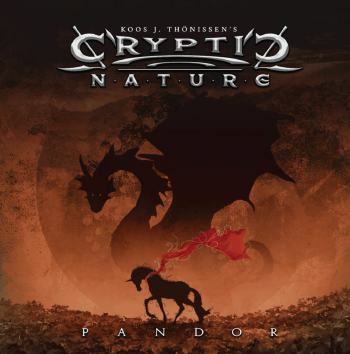 Ambition is great and I think Koos J. Thönissen, the brain behind Cryptic Nature is a very ambitious guy. After playing several instruments in many bands, he opted for the ultimate; A true rock opera, spanned over two discs. The story behind Pandor, is one of dragons ruling the earth. I will not bother to tell the whole story, narrator Ian Jillings kind of explains what's going on during the album during the short interludes and introductions of the tracks. Starting with side One, musically this disc has a melodic side; where the presented vocalists do not really impress me. During the more harsh compositions, Gol Matoo - Meteorite Impact and Ael Hathor the music gets interesting; fierce guitars and brutal vocals lift the album towards an almost acceptable level. The second disc holds nice powerful playing, like the opener The Meeting. Too bad the poor vocal efforts make me skip the rest of the tune. The final two tracks are musically quit OK, but again, those vocals. However ambitious the project is, the vocals presented are pretty poor and the powerful guitar parts and harsh elements cannot lift the album up to an acceptable level. I would recommend Koos to stick to his guitar and find some decent vocalists.